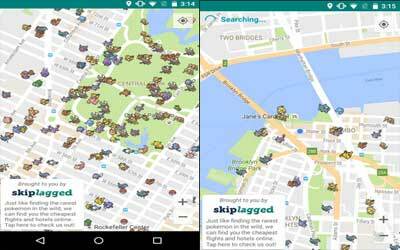 Pokemap Live – Find Pokemon by Skiplagged APK has been updated so we can download the latest version 1.31. This application was developed by Skiplagged to help Pokemon GO Trainer to capture monsters. These apps are also fairly easy to use, once downloaded, we can open the application and we will see map with some information which is very easy to understand. To find the Pokemon in your current location, tap the location icon in the upper right corner on this application and this app will detect GPS, then began to scan monsters. We can also include accounts that you have to get more accurate location and monsters. But in my opinion, it is better to not use our primary account for the safety of our account. But the developers of this game, Skiplagged, claiming that they never save your account to the server. If we still do not feel safe, we can use the new account. By using the new account, the application will continue to run normally. In this app we will get some information, we can see disappear time. I think it is common features which is available on many apps. We can also see the monsters on other locations, so not only on your current location but also on areas which we want to know. Pokemap Live has route feature and this is my favorite feature. When you tap the monster, there is route button. It will show us the route to the monster location on Google Map. So we can go to Pokemon location easily. This app helps me to find pokemon easily. I can search monsters on my current location or also on other location. The app shows realtime data, runs smothly, and works great on my device. But this app just shows disappear time and pokemon name, there isn’t more information about the pokemon. Overall, it is great tool for Pokemon Trainer.